Methane consumption by (i) anaerobic oxidation of methane, and (ii) aerobic methane oxidation. (Figure from James et al. 2016). Microbes are globally distributed among different environments and catalyze most of the geochemical processes. 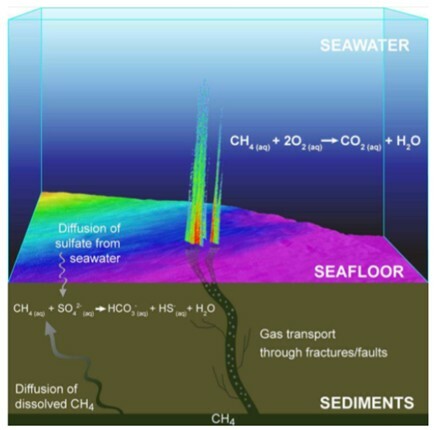 In cold seep habitats, microbes anaerobically and aerobically oxidize released methane to convert it into carbonate in the sediments or into carbon dioxide above the seafloor respectively (Figure 1). Fig. 1 Methane consumption by (i) anaerobic oxidation of methane, and (ii) aerobic methane oxidation. (Figure from James et al. 2016). 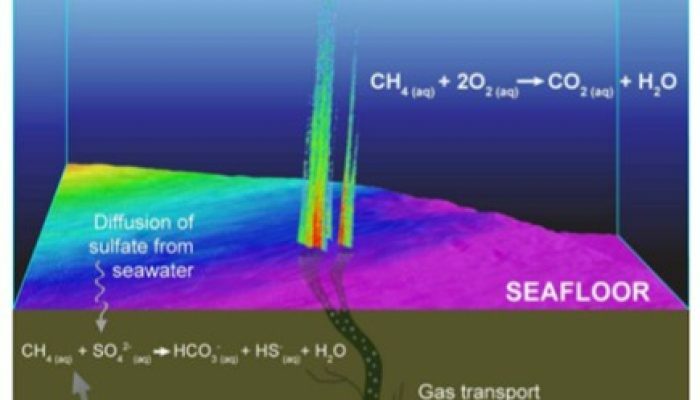 Their role in the global carbon budget is such that anaerobic activity below the seabed may prevent up to 80% of the methane released to reach the atmosphere. However, changes in oceanographic processes can influence the structure and the composition of these microbial communities, that remain poorly understood. These changes may have a cascade effect on the efficiency of methane oxidation. Recently developed methodologies and technologies in molecular biology, such as -omics techniques and fluorescence in situ hybridization, allow scientists to identify active microorganisms and genes associated to their metabolic activities. Additionally, microbes can be isolated through enrichment and cultivation methods. Cultures offer for instance opportunities to test resilience of these microbes to environmental changes, such as temperature and methane concentration variations. James R.H., p. Bousquet, I. Bussmann, M. Haeckel, R. Kipfer, I. Leifer, H. Niemann, I. Ostrovsky, J. Piskozub, G. Rehder, T. Treude, L. Velstade, and J. Greinert. 2016. 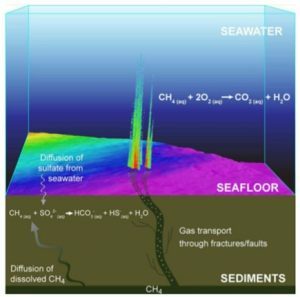 Effects of climate change on methane emissions from seafloor sediments in the Arctic Ocean: A review. Limnology and Oceanography. 61(S1): S283-S299. This blog post was written by Vincent Carrier. He is a PhD student at CAGE (center for arctic gas hydrate, environment and climate) in the University of Tromsø. He is a microbiologist, specialist in DNA analyses of the microbes in methane seep environments. His current research is about to characterize the methanotrophic bacterial communities and the communities responsible for the anaerobic oxidation of methane in different seep environments in the Arctic. Jasper Bloemen is a Post-doc researcher at the University of Innsbruck, Austria. He is currently PI on the project “The role of respired CO2 recycling in tree carbon allocation” funded by the Austrian Science Fund (FWF). After obtaining his PhD at Ghent University, Belgium in December 2013, Jasper moved to Innsbruck to continue his research on tree ecology. His main interests are tree carbon cycling and tree mortality. Currently Jasper is using stable isotope labelling combined with laser-based carbon isotope measurements to understand the role of carbon recycling in tree carbon allocation.